The most gorgeous, dreamy, fun and classy destination wedding we have ever come across! Time and again I come across destination weddings that not only stun me, but has by jaw literally on the floor. 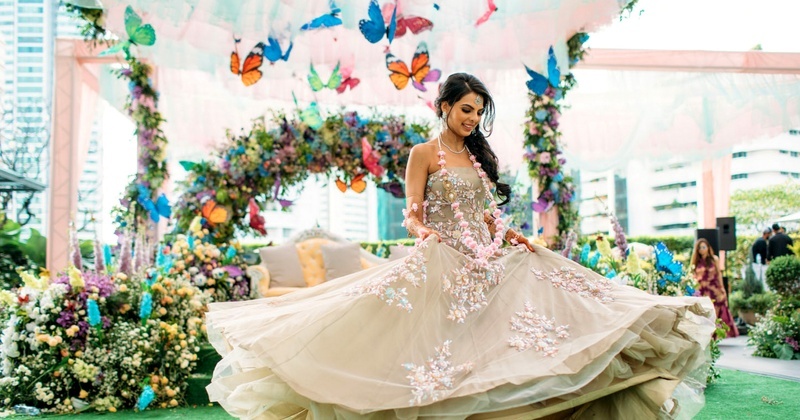 And one such dreamy destination wedding is that of - Mira Uttam and Ravine Mahtani which took place in Bangkok. It’s classy, fairytale-like and completely Drop-Dead-Gorgeous! For her engagement ceremony, the bride wore a maroon off-shoulder Manish Malhotra custom made gown looking her stunning self. Totally digging those satin sleeves detailing of the outfit! Her better-half completed her look in a maroon tux paired with statement shoes, totally complementing her look! Gives some serious ‘Alice entering the wonderland’ feels right? Also, how stunning is her intricate mehndi design? P.S. - that engagement ring is one stunner! Their sangeet party saw a dance floor like no-other, and you have got to check out their dancing shoes! It’s fab! It’s a sindhi tradition in which they tear of the groom’s clothes before the night of the wedding. I totally admire how she’s ditched all the reds and maroons and opted for an ivory Sabyasachi lehenga with multi-coloured embroidery on it. She’s paired the lehenga with emerald choker, minimal jewellry, day makeup look and a single dupatta! Love how effortless the whole look is! The groom on the other hand is twinning with the bride, opting for a ivory based sherwani with zari thread work on it. This by far is the most exciting part of the whole wedding. The groom entered on a Batmobile. Yeah you read it right, a Batmobile! That too a customised Batmobile with the words ‘Rav’s Baraat’ printed on both sides of it! Check out his groomsmen's customised T-shirts! Such a cool idea, don't you think?